The Dunes et Soleil campsite is aptly named as it is situated in the lee of a giant wild dune that lies next to the golden sands of a wide beach. The six-kilometre stretch of beach is perfect for whiling away long summer days full of sunshine, paddling in the surf, collecting shells or sunbathing the days away. The evenings are filled with on-site entertainment or amusements that abound among the many shops and restaurants lining the seafront. 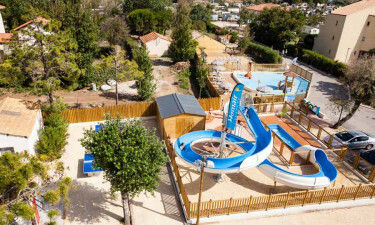 The Dunes et Soleil Campsite has everything you could possibly want from a camping holiday - contact the team at LUX-camp to find out more now! The outside gate at Dunes et Soleil will be locked after 22.00pm each night. This means that there Is no access to reception parking, so if you arrive after 22.00pm will have to use the on-street parking outside the campsite (which has very limited places) Also, to access the site on foot after 22.00pm, you need a code which can be given from the courier on site. Why should I choose the Dunes et Soleil Campsite? Children will have a whale of a time in the fantastic new splash pool, which features a gentle paddling area with fun equipment, ideal for little ones. Older kids will love the water-slide, which provides hours of entertainment. There are plenty of sun loungers around the pool complex so you can relax while your children frolic. The Dunes et Soleil Campsite prides itself on its friendly and welcoming atmosphere. Hosts are always on hand to answer any questions; there are evening entertainments and plenty for children to do such as ping pong, dancing and an adventure playground. If you feel energetic, you will be pleased to find that there are many sports for people of all ages, such as boules, a gym, and bicycles that are available for hire. 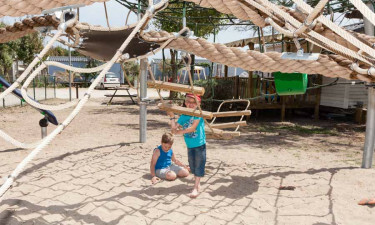 As with all LUX-camp resorts, the accommodation at the Dunes et Soleil Campsite is kept immaculately clean and is always maintained to a high standard. There is a choice of luxury camping options, such as mobile homes. Cars and motorbikes can be parked next to the pitch, and patio furniture is also included. Rest assured that all the facilities you would expect from a campsite are provided, such as baby changing facilities, washing machines and dryers. 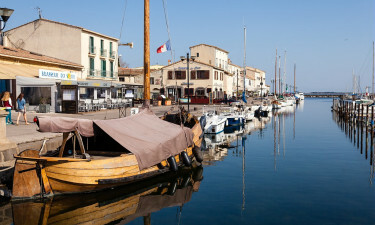 The location of the luxury camping site is very near to the busy town centre of Marseilles-Plage so there are lots of bars and restaurants, as well as plenty of things to do. - very popular with older children and teenagers. If you feel like a gentler day out, you might enjoy visiting the historic Abbaye de Valmagne, Villevey where you can explore the well-preserved buildings with beautiful gardens, eat at an organic restaurant, and sample wine from its own vineyard. There is a small grocery shop on site, and there are plenty of shops in the nearest town of Marseilles-Plage, so campers will find some lovely gifts to bring back to friends and family. The Dunes et Soleil Campsite has a snack bar, which offers takeaways, on-site, and is open during the high season.